Veteran rockers Dinosaur Jr. enthralled a sold out Commodore Ballroom last night (September 30), playing a high energy set that got fans of all ages moshing hard. Three weeks into another leg of tour supporting their August release, Give a Glimpse of What Yer Not, the band played with intensity and cohesion. Moon Duo (of Portland via San Francisco) were the opening act, playing with an additional member, drummer John Jeffrey of Vancouver. Their driving psych sound got the floor of the venue to fill up as concertgoers tapped their feet along to insistent beats. 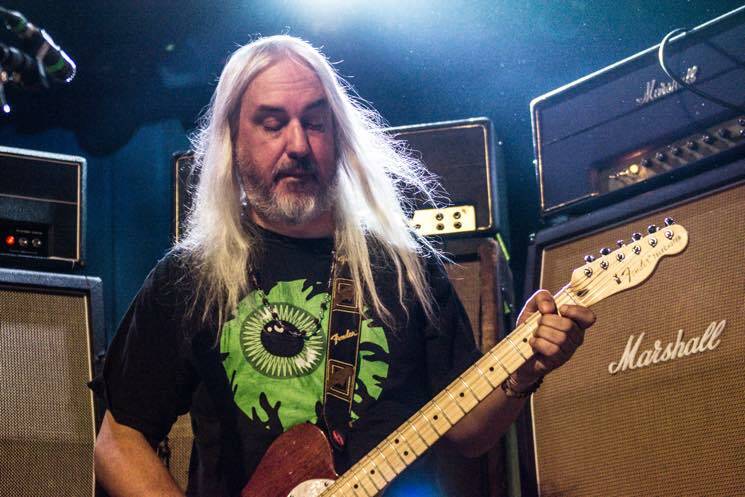 The venue became increasingly crowded in anticipation of Dinosaur Jr, as fans watched lead singer and guitarist J. Mascis' Jazzmasters get tuned, as his immense pedal board was set up. Taking to the stage with little fanfare, the band launched into "Bulbs of Passion," off of their first album, 1985's Dinosaur. "Watch the Corners" from 2012's I Bet on Sky brought darkness, which was juxtaposed by the melodic "Pieces." Emphasis was of course put on playing songs from Give a Glimpse of What Yer Not, which were sprinkled in throughout the set. The chugging riffs of single "Goin Down" sparked the audience's frenzy, though Mascis remained stoic, putting his energy into the music without cracking a smile. He took breaks to drink Gatorade and what amusingly appeared to be a green smoothie. Even from the front of the audience, his vocals were inaudible for almost the entire set; bassist Lou Barlow's came through with more clarity. This took away from the performance, but the energy of the crowd and strength of the band as players left fans satisfied. To say that Dinosaur Jr. are loud is an understatement. Both surrounded by stacks of Marshall amps, Mascis played effortlessly, weaving solos around chugging riffs and more melodic lines, as Barlow (sans shoes, by the way) became part of his instrument, his intense physicality giving the music warmth. Much loved drummer Murph was relentless, pounding out the varied rhythms of tracks that traversed the band's discography. The crowd, comprised of middle-aged and millennial fans alike, lapped it up, spiritedly pushing and shoving throughout much of the set. There were countless stage divers and crowd surfers, as fans in the front row hung onto the barricade-less stage. At some point both a leather shoe and a Tim Hortons branded cowboy hat were even thrown onstage. Dinosaur Jr. gifted Vancouver with a raucously fun Friday night of rock, playing tracks that spanned their discography to a crowd of both old and new fans. There is a simple joy to giving in and experiencing the immediacy of powerful rock music — something all in attendance at The Commodore certainly felt.